HOUSTON – When NASA's shuttle Discovery arrived at the International Space Station Saturday (Feb. 26), it made some space history: It marked the first time ever that spaceships from four different space agencies were docked together at the same time. 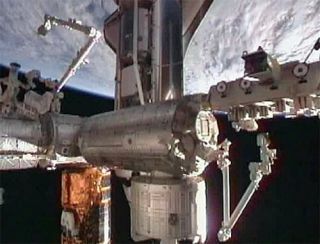 The historic moment occurred at 2:16 p.m. EST (1916 GMT), when Discovery arrived at a docking port on NASA's Harmony module, a multi-port hub on the space station. The shuttle joined two Russian Soyuz space capsules and three robotic space freighters (from Europe, Japan and Russia) that were also docked to the orbiting lab. "That that's about as many different visiting vehicles as you can imagine," Discovery astronaut Alvin Drew radioed Mission Control in Houston before the docking. With Discovery's arrival, the space station's mass jumped to 1.2 million pounds (544,310 kilograms). It is as long as a football field, making it the largest man-made structure in space. The station is so large that on clear nights it can easily be seen with the unaided eye if you know where to look, and sometimes even rivals the planet Venus in brightness. The $100 billion International Space Station has been under construction by 15 different countries since 1998. It is currently home to six crewmembers from the U.S., Russia and Italy and has about the same amount of living space as a Boeing 747 jumbo jet. First, an unmanned Japanese cargo craft called the H-2 Transfer Vehicle-2 (HTV-2) arrived at the space station on Jan. 26. On Jan. 28 Russian launched its robotic space freighter Progress 41 toward the station. It arrived two days later. An older Russian cargo ship, Progress 40, also undocked from the station to make room for yet another addition: the European Space Agency's second unmanned cargo ship. The ATV-2 Johannes Kepler arrived at the station less than six hours before Discovery lifted off. Discovery launched Thursday (Feb. 24) from NASA's Kennedy Space Center in Florida. This is Discovery's 39th and final spaceflight before being retired along with the rest of NASA's shuttle program later this year.The shuttle is delivering a new storage room and a humanoid robot, called Robonaut 2, to the International Space Station. Two Russian Soyuz spacecraft, which carried the six astronauts aboard the station in teams of three, are also linked to the space station. "It's a pretty amazing time if you think about it," Bill Gerstenmaier, NASA's space operations chief, said before Discovery launched. "To think of all these international control stations working together – it's an amazing system of operations and systems to keep all the bits moving forward. What a great time in spaceflight." The novelty of so many different spacecraft at the International Space Station has not been lost on NASA and its international partners. They hope to stage a space photo session by cosmonauts flying around the station in a Soyuz spacecraft if time allows during Discovery's flight. A final decision has yet to be made, but if allowed, will add an extra day to Discovery's 11-day mission. SPACE.com managing editor Tariq Malik (@tariqjmalik) contributed to this report. Follow SPACE.com Staff Writer Denise Chow on Twitter @denisechow. Visit SPACE.com for complete coverage of Discovery's final mission STS-133.